The 2013 British athletics and Scottish ultra trail championships were incorporated into the 8th running of the HOKA Highland Fling on Saturday 27th April. The race is held over the 53 mile stretch of Scotland’s iconic long distance trail The West Highland Way trail, from Milngavie, a northern suburb of Glasgow to the beautiful Village of Tyndrum in Highland Stirlingshire. Held in good, almost perfect conditions,“The Fling“ as it has become known, has grown to become one of the largest ultra trail races in the UK and this year almost 500 runners toed the start line for the early 6am start. Ricky Lightfoot (Salomon trail team ) and Duncan Harris (Chester tri) were together at the first checkpoint at Drymen (12 miles ) in 1hour 21min with Lee Kemp (Team Craft) a minute behind. 2 minutes further back were a group including Abingdon’s Paul Fernandez, recent winner of the Self-Transcendence 50km race at Perth, course record holder Andy James (Newbury) and a strong Scottish contingent with local experience of the course including Matt Williamson (Bellahouston RR) Marco Consani (Garscube), Paul Giblin Paisley, with Donnie Campbell and Richie Cunningham a further minute back. Former Lakeland 50 winner Tracy Dean was leading the ladies with1 hour 37 min by 4 minutes from Claire Shelly (Serpentine). Reaching Rowardennan, below a snow capped Ben Lomond in 3.31 (26 miles) Lightfoot had built up a good lead of 8 minutes from Kemp with Matt Willliamson now using his local knowledge of the course to be clear in third. The tough and rough trail stretch at the top of Loch Lomond to Beinglass (40 miles ) saw Lightfoot (5.18) maintain his lead with Kemp (5.23 ) still in touch 5 minutes behind and Williamson still holding 3rd (5.34 ) ten minutes back. Donnie Campbell 3rd in the British 100km Road champs a month previously at Perth had moved up to fourth with 3.27. Through Glen Falloch Kemp slowly made inroads into Lightfoot’s lead. On the 3 mile forest stretch above Crianlarich around the 46 mile mark ,which is a bit of a roller coaster featuring a succession of short but steep ascents and descents, Kemp took the lead. Once back on the easier final five 5 mile stretch, he built up a good lead to reach the finish at Tyndrum in 7.03.48 to take the British title in a new course record almost 9 minutes inside the time set by Andy James in 2011. Lightfoot with 7.09.30 was also inside the old record in second, and Matt Williamson in third knocked a huge chunk off his PB on this course with 7.21.52. to take the bronze GB medal and also retain the Scottish title he won here in 2011. With the Fling being used as a trial race for the IAU world ultra trail championships in Wales in July, the excellent times for Kemp and Lightfoot make them strong contenders for selection for the GB team with Williamson also likely to figure in the selectors thoughts too. Lightfoot found the last sections tough, but was still delighted with second place. He was unable to stay for the prize giving as he had to return to Cumbria for an evening shift as a firefighter!! Scottish champion Williamson who had targeted this event over the British 100k champs at Perth in March, showed he had chosen wisely and prepared well and was delighted with his time and 3rd place in the GB champs. In the ladies race Dean despite incurring a bad calf problem in the first 15 miles which slowed her considerably, managed to lead all the way. She reached Rowardennan in 4.03 and had opened a ten minute lead over Shelley, with Alicia Huddleston and Sandra Bowers some 3 minutes adrift in 4.17 and Harmeny’s Fiona Cameron in 4.22. The event, which like so many, has grown from an idea hatched almost as a group training run (Thankyou Ellen McVey!) 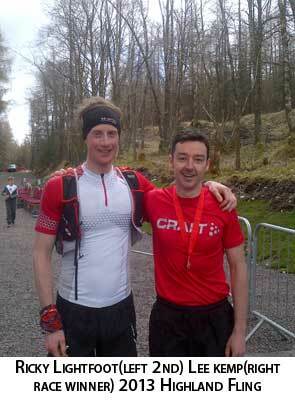 into one of the most popular 50 milers in the country, was once again organised superbly by John Duncan and his team.